To find out what style the new addition to the Great King Street range should be, Compass Box released this, the batch TR-06 of the Compass Box Great King Street. This blend rivaled the lightly sherried, un-peated, batch 00-V4. To find the winner, it was left up to the public to decide which whisky was going to win, and become the new permanent addition to the Great King Street range. 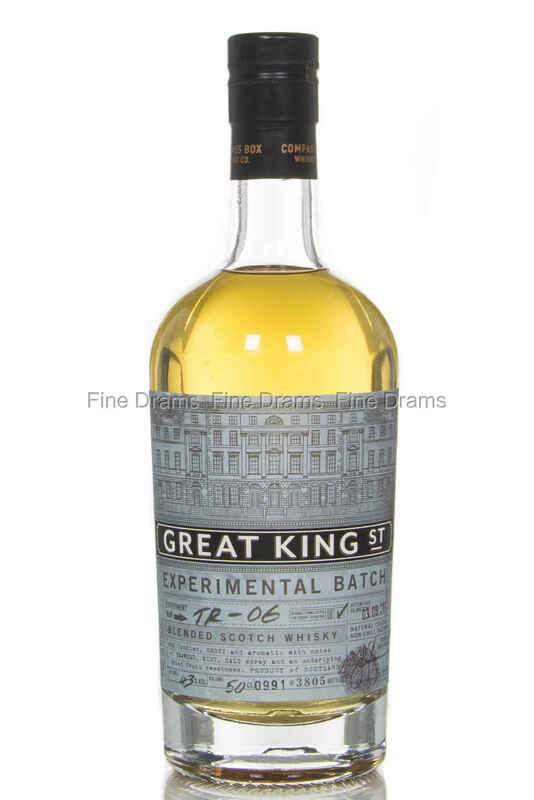 The experiment was concluded in 2014, and (spoiler) this blend ended up winning, and is now a permanent addition to the Great King Street range. It now goes under the name, Great King Street—Glasgow Blend. The scotch whisky association have banned us from telling you what's in this, but we are still allowed to tell you what we smell and taste. So we are being extra cheeky here. Nose: Quite peaty, reminiscent of Laphroaig. A nice waxiness, similar to a mix of Clynelish and Benrinnes. A distinct maritime note, with a large dose of salt. Reminds us slightly of a Christmas dinner; roast turkey with a side of cranberry sauce. Roast potatoes with thyme and rosemary. Finished off with lemon cake. Taste: Instant peat at first. Afterwards, the creamy lemon from the nose asserts itself again. Big and powerful. Beyond the peat is a very pleasant tropical fruit, almost tinned pineapple or tinned peaches. After some time in the glass, a distinct minty freshness appears. Finish: Long, peppery, with some fennel and either star anise, or liquorice. We can't quite put our finger on it. Overall: Definitely one for people who are intrigued by peat, without wanting to jump off into the deep end. A nice introduction, but Mr Glaser has blended this with enough skill to keep us on our toes. Peat, and tropical at the same time? We applaud him!